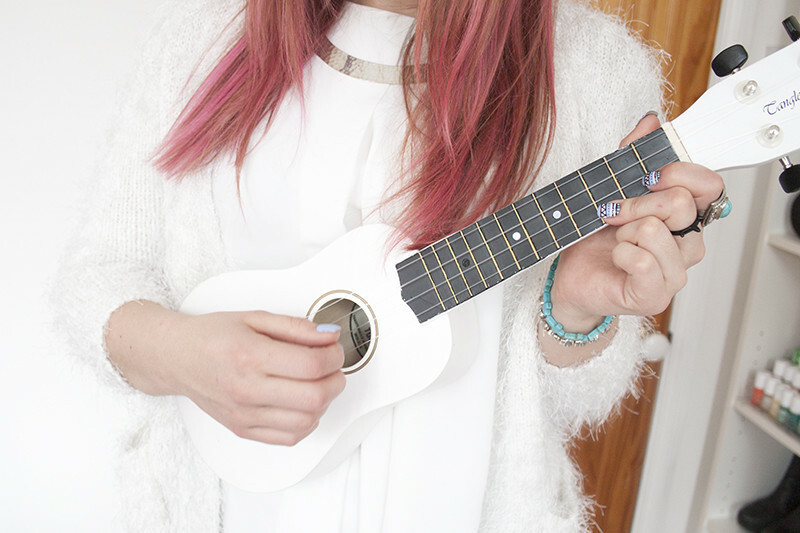 Excuse the old pink hair photos i've been wanting to post about my experiance learning to play the Ukulele for ages but I just havent got around to it quite yet! Now I know this isnt the usual thing I'd talk about on my blog so please bare with me if you have no interest at all about musical instruments but I get asked a lot about it so I thought I'd talk a bit about my experience learning! While I am still by no means an expert at it I have really enjoyed learning and picking up a new skill. I think its weird being an adult because things like learning to play a music instrument are seen to be a little bit odd! 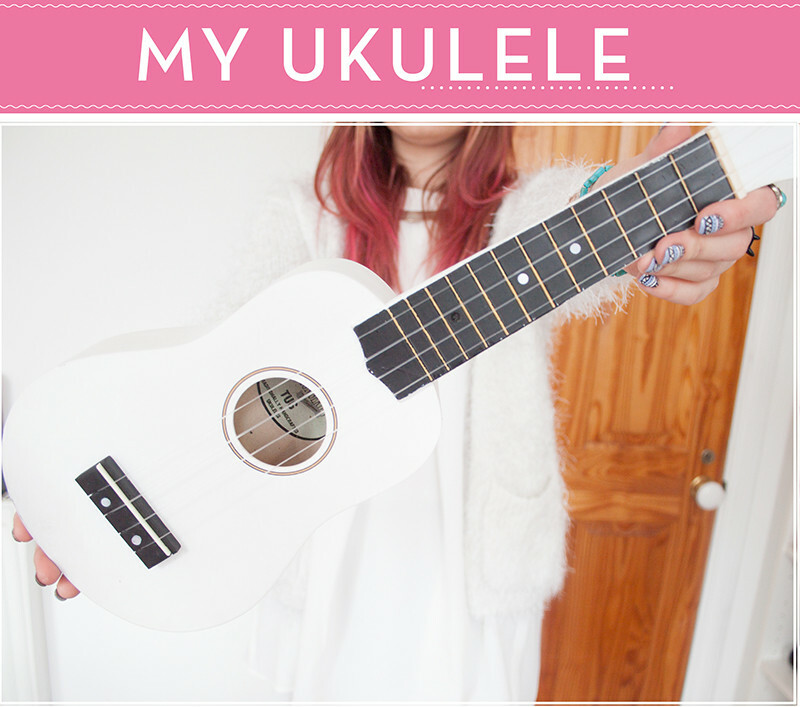 I bought my Ukulele of ebay one night when I was really bored, stressed and emotional. I dont know why, I've never really had much intrest in playing a Ukulele specifically but I thought it would be something new to do. 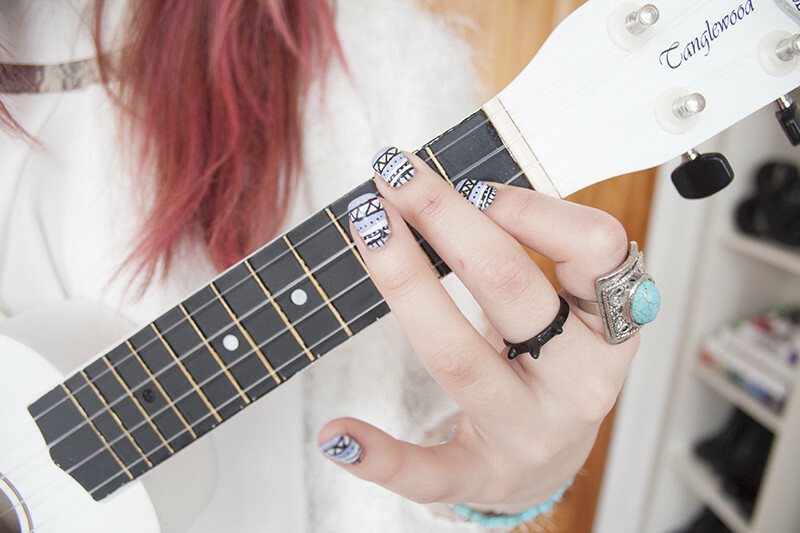 Ukulele's have a high sucess rate in learning to play as it is actually very easy to pick up. I love my white one as I was going through a white phase at the time and I love the way it looks. You can get them in loads of different shapes, colours and sizes but I opted for this one purely because it was the first that came up. I would recommend getting some new strings for it as well, I use the Aquila ones which were recommended to me by my teacher. Lina mentioned that we should go to lessons so we decided to book a block of four with Learn to Uke. We decided to go to the absolute beginners class despite both knowing how to play a little before we went. Lorraine is a great teacher and the sessions lasted 2 hours and moved fairly quickly. We'd learn 3-4 songs per lessons as well as new chords each time. Now it sounds like it movers very quickly but I found it much better as it meant a lot at home practice but the more I felt like I had someone to show me then go home and practice the easier I found it. The price was really fair and I think me and Lina have decided to go to the next block of classes when we next have free time. Other than my Uke lesson I've been watching a host of videos on Youtube teaching you how to strum and do various other things. It's easy to keep watching over and over as everything is repeatable. Their are tons of Ukulele tabs all over the internet as well to keep you occupied and to be honest most Uke songs are very simple to play. In all I've loved learning to play my Ukelele and I cant wait to keep going with classes and play more. I couldn't believe how far I'd come in just four two hour lessons and practicing for about 30 mins a day. I really want to make background music for my Youtube videos next! I love it an odd post about something a bit different Lily, it mixes things up and its nice to get to know you better. I've wanted to learn an instrument for ages, I think its super awesome that you're taking something up like this! Making background soundtracks for your videos would be super amazing! You should upload a video of you playing after a few more lessons! for a second i thought you had redyed your hair and got all excited, it suited you so much! I really love your photos :) Great post! I love playing my Uke, was my favourite Christmas present a few years back! I have a ridiculous amount of books and sheet music, but I really enjoyed an app I downloaded recently which helps with scales and chord progression. It's called Jamn, and it's been more useful than I imagined. I would also suggest getting the Hal Leonard Ukulele Method: Book 1, one of the better learning books I've come across. I have loved the ukulele music you have put in recently on your videos can't wait to hear some of your music! aaaaaaah this is so exciting!! :) hope to hear you play in a video soon! I bought a Uke and never actually learned to play it, I got frustrated and gave up. I think I will try again. aww, I thought you had done your hair pink again. And maybe film a video of your playing the uke one day! Loved this post! i played the ukulele for 6 months then gave it up. This makes me want to learn to play my uke properly! I can only manage 3 songs at a push ha. Your nails look amazing! Love that instrument. It's beautiful.